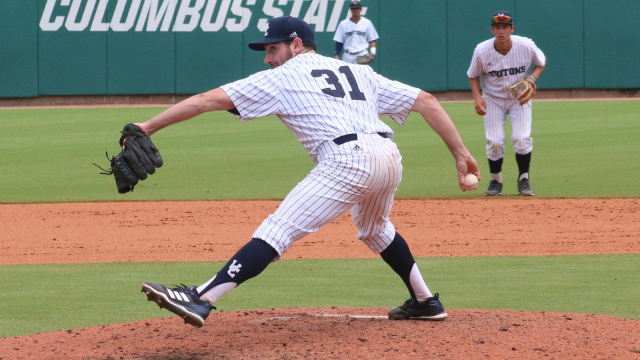 UCSD baseball team nearly dug itself out of an early hole in the 7-4 loss to Southern New Hampshire on Wednesday night and ended its run at the Division II College World Series in Cary, North Carolina. The Tritons trailed 7-0 after the first inning before their offense came to life. UCSD rallied to scored in three-straight innings, from the fifth to the seventh, but the rally fell short. After the fourth inning, Newman had a pep talk with his team in the dugout. He said the team was being too emotional and the players needed to get back to playing fundamental baseball. That seemed to have worked. At the top of the fifth, Michael Palos hit a solo home run to left field to put the Tritons on the board, 7-1, and to get the momentum back. The Tritons scored in the next two innings to make it 7-4. Closer Cameron Kurz, pitching in the last game of his college career, kept UCSD in contention with 4 2/3 shutout innings. He recorded six strikeouts over that stretch against 14 batters and allowed no hits or walks.